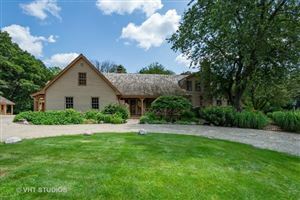 An American treasure located in the heart of Barrington Village! Fully refurbished & doubled in size in 2017 with a 3-story addition incorporating a brilliant blend of vintage detail & modern amenities. The sun-filled living space offers all NEW custom elements incl oak flooring, cedar shake roof, Marvin windows, open floor plan & high ceilings on every level. Gourmet kitchen complete with inset cabinetry, Wolf/Sub Zero appliances & amazing walk-in butler pantry open to dining area with built-in buffet & spacious family room w/ full masonry fireplace. Divine 1st floor laundry/mudroom! Stunning master suite boasts beautifully detailed bath featuring zinc double vanity, walk-in Carrara marble shower & cast iron tub. 3 secondary BRs & ample hall bath complete the 2nd level. Finished deep-pour English lower level w/ 3rd full BA. Covered porch & private yard w/ bluestone patio + the ultimate man cave are perfect for outdoor entertaining! See Add'l Info for details!!! Agent Owned.